People have often expressed surprise that I opted to have my treatment and care in Asia and not returned to the UK. When I describe the level of care, the facilities and equipment of the hospital and the promptness of appointments and treatments, surprise usually turns to envy! When you add that to the fact that it is so much easier to work at convalescence and recovery in a warm climate, with access to an outside pool, and in an environment of lush vegetation and tropical flowers it is not difficult to understand why it was also preferable to go through the chemo cycles in this part of the world. There is another factor which is important too, which I have mentioned in passing but I want to highlight now. That is the exceptionally supportive medical care I have here. When I first consulted my GP here, I did not know how big a role she would play in the coming months, and how fortunate I am. In fact, when I first walked through the door I had not even met her before. That was soon to change, and she was in constant contact while I was in Bangkok at the time of diagnosis, surgery and treatment. In my return visits home between chemo cycles, she was there to keep an eye on me in my weakened chemo state, and to make sure I was fit enough to head back to Bangkok for another chemo bashing. I have described my encounter with pneumonia and how she got me through that. So I was honestly not so surprised recently when she offered to use up some of her free time when in Bangkok to be trained how to clean and use my port. This would mean that I could have the port flushing done regularly here, without having to travel to Bangkok for the procedure. Arrangements were made and a few weeks later when my Dr was in Bangkok, she spent an afternoon on the oncology ward with the nurses, becoming familiar with the port and the procedure for flushing it. There was just one slight problem. My hospital is not a teaching hospital, so unfortunately my Dr could not practise on a real person, but could only observe. I hadn’t realised that. But there is always a solution and the solution to this was inspiring! My Dr was provided with a sample port so that she could see how it functioned. And a teddy bear to practise on!! I approached my port flushing time rather anxiously. I was reassured by photographs of the teddy having his port flushed and was glad to know that he not only survived but suffered no ill effects. I was less impressed that teddy did not need the magic Emla numbing cream. Good for teddy but don’t expect me to be that brave! I was very nervous at the prospect of being the first human patient. The day of the flushing I was extremely nervous. 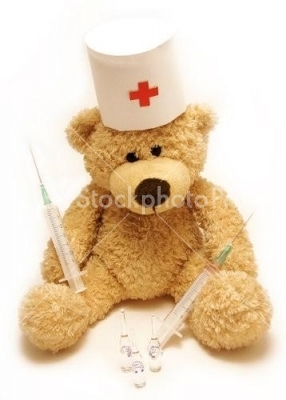 I don’t like needles, and I really don’t like having my port flushed. And for all that teddy didn’t flinch when he had his port flushed, he did wear it outside his skin, and not hidden underneath like mine so it was a bit easier to find. It was also quite alarming to see my Dr all gowned and masked for the procedure. I think we were both probably as nervous as each other. However her training had been thorough, she was confident, and she had all the necessary accoutrements, needles and necessary meds. We had a slightly scary time when the blood return did not work at first and needed a bit of exploration and re-inserting of the needle. There was great relief all round when the blood return did work and the flushing could take place. There were two people wearing very wide grins after the procedure. That’s not including teddy, who was probably grinning too. I was even given a crunchy chocolate frog when back in the waiting room – a treat usually reserved for the younger patients, but which I very gratefully accepted when offered! So I consider myself extremely fortunate. I have the best of medical care and treatment, a warm and pleasant environment to support my recovery, the inventiveness of teddy bear training and the incentive of a chocolate frog to make sure I don’t forget to get my port flushed! It is generally agreed that people are either a morning person or a night owl. I have always loved mornings. I love the way the sky turns from inky black to a deep translucent blue as the sun approaches the horizon. I love the way that the sky takes on a purple hue and clouds turn pink as the sun rises. I love the soft gentle light, casting long, optimistic rays of sunshine across the landscape. I love being a witness to morning routines in the countries I have lived in over the past few years. It is particularly special here. 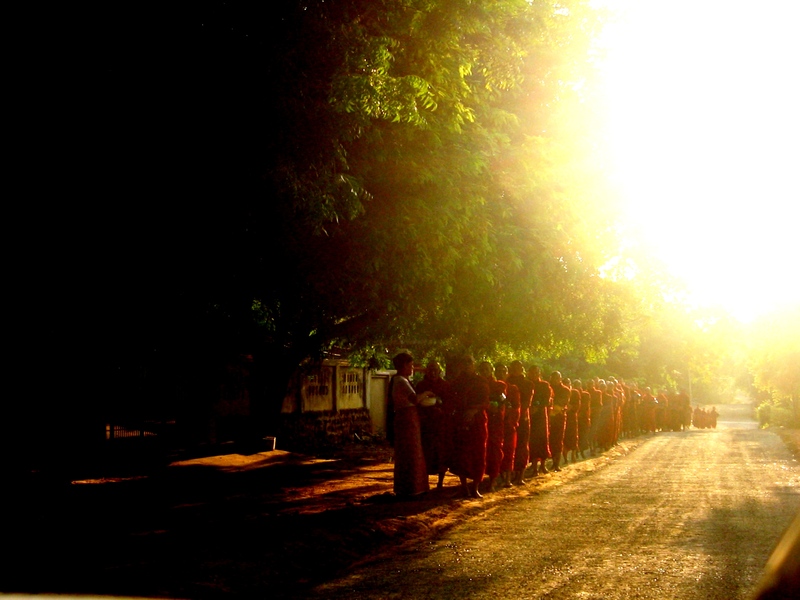 There are long lines of monks in the mornings, collecting alms as the dawn breaks. Birds sing loudly in the garden to announce the new day. Children make their way to school with their green and white uniforms and adults head to their place of work with their aluminum stacking lunch boxes. So I find it really unfair and cannot understand why I find it such a struggle to drag myself out of bed to enjoy mornings! I go to sleep early, but still cannot part company with my comfortable bed in the morning and put off getting up until I absolutely have to. I’m fine once I am up, but the act of opening my eyes, and actually getting out of bed, rather than pressing the snooze button on the alarm, usually defeats me until the last moment. I wonder if the after effects of the heavy treatment contribute to this. I understand that it takes about a year, or at least as long as the treatment lasted, to re-build properly after the cancer triathlon. I have to remember that it is just under 6 months since I finished my triathlon so I guess that I should not be too hard on myself. Perhaps I should consider it a special skill that I am able to sleep for 10 hours or more some nights? I should also factor in the time that Tamoxifen keeps me awake in the night time hours, but I don’t think they add up to so many hours now. Well, last night i went to bed with a resolution that I would not only get up early, but that I would head to the pool before breakfast! The reason for this? Firstly I enjoy my swim so much and Monday evening is Pilates evening. Therefore I felt it would be a nice way to be able to factor in a swim without having to wait until Tuesday. Secondly, Twang Arm has mounted a bit of an offensive over the past couple of weeks. I am not sure how or why, but it has been a bit more painful and stiff and I know that swimming is helping. Thirdly, at my Annual Check Dr W2 took great delight in telling me I had gained a kilo in weight despite my insistence at this being impossible due to my evening schedule of swimming or Pilates. So all in all, it seemed that the time is right to crank up the exercise machine, enter a stand off with Twang Arm – and head to the pool for a pre-breakfast swim. So this morning, after a particularly sleepless night (no idea why) I forced myself out of bed when the alarm peeped at 6 am. The sky was a delicious pink and orange as I put on my swimsuit and the morning air misty and cool as we headed out to the pool. I was in the pool, alongside 2 serious swimmers doing serious lengths at 6.26 am! 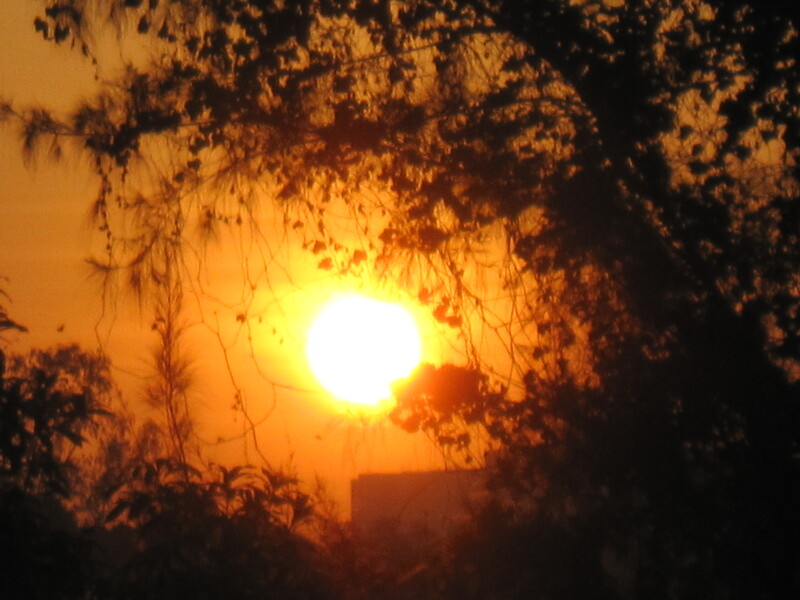 In the East, the sun sat heavy, large and red on the horizon as I started my gentle swim up and down the pool. Within a few minutes the other two swimmers had completed their lengths and I was on my own, with the company of birds, little frogs, crickets and palm trees as the sun climbed in the sky, getting briighter as it rose. I had a glorious 30 minutes swimming 30 peaceful and healing lengths and was out of the pool, showered and back home having breakfast at the time I am usually serially pressing the snooze button on the alarm. So it was a bit of an effort but well worth it. Let’s see if a couple of morning swims a week, in addition to the evening ones start to break Twang Arm’s spirit and help to stop the kilo gain. And I guess all in all, it was not bad for a morning owl!! This is rather an unusual situation. I am somewhat lost for words and not sure what to say. Then, on Tuesday evening, a real surprise landed in my lap with news from Breast Cancer Care – the exciting news that Feisty Blue Gecko was in the great company of 8 other Breast Cancer Bloggers in receiving an Award for Awareness Month Blog posts. This October, the Breast Cancer Care forums, twitter, facebook and all manner of online communities were buzzing with activity for the Breast Cancer Care Blog Awards………………………..
There’s a real range of subject matter, including personal tales of treatment for breast cancer, reflections on the long term impact of having had a diagnosis of breast cancer, as well as discussions about the annual Breast Cancer Awareness Month and what it really means to people who have experienced breast cancer. I have always said that blogging my experience, sparing little detail, has been like a download button for me and in fact been a coping strategy. It has also connected me with many others in a similar situation bringing an extra dimension of support. You can see how vibrant the blogging community is from the selected blog posts above, and also on the growing list on the right side of this page. So I find myself blushing somewhat – you could say I am tickled pink with the award, particularly when blogging has been such a lifeline for me. Thank you so much for this lovely boost, and your ongoing support, warmth, friendship and encouragement. It is over a week now since the Big Check and for the first time in what feels like forever, I feel I am finally moving forward. I have found myself using corny expressions to describe how it feels, and corny they might be but they also feel highly accurate. I really do feel as if a curtain has been lifted and I am able to see much more clearly ahead of me. I didn’t realise just how much things felt as they were “on hold” and how much I was pinning on the Big Check. I have been reluctant to make any plans, and even things like colouring the new hair has been avoided in case there was anything which meant more chemo and losing it all again. No point in colouring it and then it all falling out. Similarly there was no point in booking a break and then finding I had to cancel because I needed treatment again. I even felt hesitant about getting a prosthesis which was more of a match – in case I would lose its match! I know this all sounds extreme, but that is an illustration of the games that your mind starts to play once you have heard the cancer word. But now I have had the Big Check, suddenly I feel as if I can finally look ahead and move forward. Earlier I described life following a Breast Cancer diagnosis as a bit like having a lens through which I now see everything. That is still the case, but since the Big Check I find that the lens has been adjusted quite dramatically, and my vision is clearer and sharper. Just like getting new glasses in fact! The result of this is that I very much hope that life will feel less dominated by cancer. The fear of course will not disappear, and I know that nothing is guaranteed. But for now, I can move forward with new priorities. I hope that this might be reflected in the blog too. Cancer is still a big deal, and will continue to provide the “inspiration” as well as information and news, for much of its content. 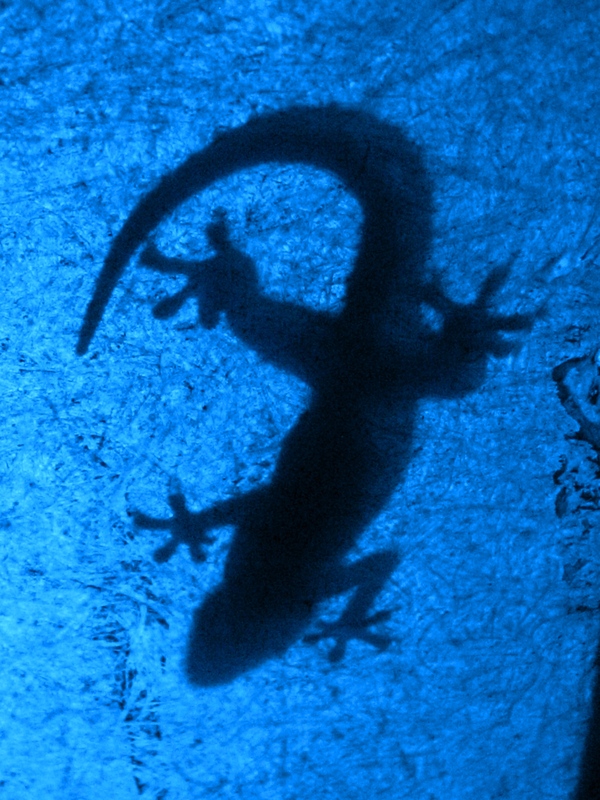 However, I think it will be balanced by more news and insights of life of the Feisty Blue Gecko, and might be a little more like the original blog. So in that spirit, I am happy to update that we in fact rushed back from the big check in Bangkok last weekend. And the reason for that was to attend a wedding here. What better way to focus on the future than by sharing the marriage of a lovely young couple and being part of the celebration of their future life together and indeed the future. And now I am preparing for a return to Bangkok next week. For the first time in well over a year this will be my first trip to Bangkok which is not for medical reasons. Visits to Thailand used to represent a break from the intensity of work wherever I was based at the time, as well as an opportunity to stock up on essentials not available there and of course yummy Thai food! I really thought that my treatment time and the frequent visits to Bangkok would actually change the way I felt about visiting the city and somehow “spoil” it for me. Well, I am amazed and delighted to say that I am ridiculously excited about my forthcoming visit to Bangkok (for work reasons) – and I have to say that this has quite taken me by surprise! That must be a clear signal that I am really moving on.